As we finally arrive at the end of this particular cycle for The Pentacles in Card Ten, endings are the very last thing these people are thinking about. They may have made it to Card Ten, but their journey is not over by a long shot. On the Contrary, this Card is strongly linked to Continuity and not endings or final Outcomes. The Pentacles have done way too much on their journey for it to suddenly come to a stop anywhere. The Pentacles from the very beginning, had long-term plans and goals which they were determined to achieve, but these plans and goals were never intended to be the climax of their lives or the final realisation of their dreams. Rather each long-term plan or goal was viewed only as a small part of a much larger and grander Major Plan. As each long-term plan or goal was reached they merely acted as spring boards to the next one. Every stage was meticulously and methodically planned out, with patience, understanding and belief. Very rarely did they take risks or try out new or novel ways of reaching their goals. They preferred to operate by the traditional way, looking to those who had already achieved success through tried and tested methods for inspiration and know how. The Pentacles and their ambition was born out of the cradle, and looking back, they really had a head start on all the other Suits who lacked their practicality, common sense and old head on young shoulders attitude. Their determination and belief in hard work being rewarded with success, very probably came prior to the cradle and was inherited through their family genes. Here we come to one of the key messages of this Card in that the continuity the Pentacles desire, goes way beyond the personal. They have not gone to all this trouble and made so many sacrifices in their life to have to say goodbye to all they have achieved at their grave. Their desire is to pass on, or hand down, that which they received in their genes, inherited or worked hard for, to the next generation so that they may continue the work of their ancestors and family tradition. The Pentacles will not pass on, or hand down, all that is theirs and hard-earned to just anyone, for there is too much risk associated with such a gamble. A lifetime’s work could be rapidly undone, if control and rights over it fell into the wrong hands. Therefore The Pentacles will seek continuity of their existence and lifetime work through those of their own kind, people who have grown up to understand and respect the same high standards, principles and responsibility of such an honor bestowed on them. What better place to find like-minded, well-trained and properly prepared people than in your own family? Your own flesh and blood, the family you have helped create, reared, fed, clothed and loved. The family who worked alongside you and gave their unquestioning support and understanding. The offspring you invested in through good education and a stable, secure home life and environment. The strong values and work ethic you instilled in them since they were babies. The respect for money, and having to work for everything they wanted, instead of being spoiled and indulged. Yes, the family were part of the long-term plan for The Pentacles and not just the individual. Any decent family want the same. They want to be able to provide a strong, stable and secure environment for their family to grow up in. We want to be proud of our children and them of us. We want to ensure financial security for them and never have to see them go without. We want to provide a roof over their heads and ensure they will be properly looked after, and taken care of, should anything happen to us. And then when we are no more, we want to make sure our family are left anything that was ours, so that they may benefit and remember us. We want our family line to continue, and in turn, our offspring to hand down, or pass on to theirs, in the same manner we have done for them. And so traditions, customs and even names continue to thrive, and family history is made. So too and very importantly so, does property, land and business. Much time has passed since we visited The Pentacles in Card Nine, when we watched the elegant and refined woman of wealth stroll in her lush garden. They had reached a time in their lives when they could enjoy the rich rewards of all their hard work. It is true, they were no longer young but they were very comfortable and wanted for nothing. They had a beautiful house, stunning garden and were in a position to afford anything they wanted. They no longer had to work so hard and were enjoying their well-earned rest, secure in the knowledge that they had provided well for their future and the future of their family. They had everything in place and a strong family around them. 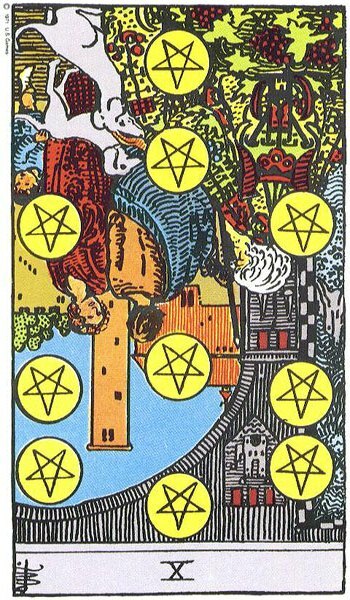 As we enter the scene in The Ten of Pentacles we are struck first and foremost by the sight of Ten Pentacles dominating the front of the imagery. The Pentacles seem to be everywhere and we must look behind them to see the personalities and scene behind. 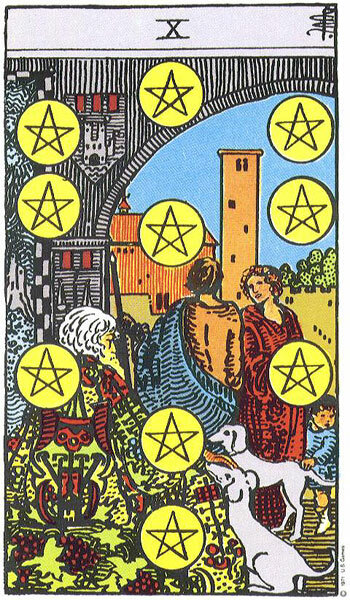 The Pentacle is a symbol of protection and with so many floating around in this Card, we can be certain the people and buildings behind them are well protected and secure. In Tarot, Pentacles represent The Earth Element and govern the material world and physical body. Therefore, these Ten Pentacles suggest strong financial protection and security. These Pentacles have been built up over time, right from the beginning in The Ace, and by the looks of it they are here to stay. In the Ten we are looking at substantial financial success, ongoing financial security and especially old money. Let us now look behind these Pentacles and see who they are protecting and who is responsible for their presence. As we all know, Pentacles(money) do not grow on trees and any Pentacle Plants portrayed in Tarot are purely for symbolic purposes. Therefore these Ten Pentacles have been earned or inherited by someone. Immediately behind the Pentacles and sitting on the left is an elderly man with well-groomed grey hair and a long beard. He sits on a comfortable but lavish seat decorated in vines and healthy bunches of grapes. The grapes symbolise, wealth, abundance and riches. The Man’s cloak is also elaborately decorated and embroidered. It looks to be quite expensive and made of high quality material. He must have some money to be able to afford such attire, but he looks comfortable in it and also quite at home sitting on his chair. This display of wealth and luxury is nothing new to him, and he does not feel apologetic for wearing it in front of so many of us who could only dream of affording similar. He has nothing to be apologetic about, because he worked hard all his life so that he could afford such luxuries. Nothing was ever given to him for free and so he is quite relaxed in enjoying what he rightfully earned. He likes others to acknowledge this too and respect him accordingly. As we look closer at the elderly man, we suddenly realise who he is. Why it is The Pentacle’s Man from The Eight of Pentacles, the Master, Expert, Highly Qualified Professional. We first saw him in the Two of Pentacles not long after he had started out in The Ace. He had already doubled the Pentacle he had been given as he headed out on his journey, and was also working doubly hard to get his long-term plan and goal underway. He was living on a tightrope, juggling his finances and personal time so that he could get his foot on the first step of his career ladder. It was tough and he had to make many sacrifices, but he knew he could do it. He was very young then, full of energy and high ambition. He dreamed of the day when he would be mature and in full possession of his abilities and potential. It would take time, much time, but he was patient and prepared to give his all to make a success of his life. We were delighted when he began his studies and apprenticeship in the Three of Pentacles. This was were he really laid down solid foundations for his future. In our story he had chosen Stone Masonry for his apprenticeship but it could have been any other trade or skill. Anyone could see by the way he applied himself to his studies and work that he had the makings of becoming a Master and Successful. This young Pentacles Man, learned his trade first hand working on the intricate stonework of the spiritual building. These places of worship were made out of solid stone, top quality materials, and built to last. He knew that for every foundation he lay in this holy building, he was also laying the foundations for his own life and success. It was an honour to work on such a magnificent construction that would still be standing long after he had departed this earth. Imagine that, hundreds and hundreds of years later, people would still be entering the building, touching the walls and admiring his craftsmanship. Like the building, The Pentacles Man intended the same for himself. He was here to stay and his success would live on long after he had gone. He was not going to be a one hit wonder or a flash in the pan success. He wanted more than that and he knew he would have to work hard to achieve it. And so he worked hard and saved hard, and we saw how frugal he became in The Four of Pentacles when every cent was held onto and nothing wasted. It was quite a bleak time for him really and he had much to learn about money and possessions, for he had become, like many who are ambitious, quite obsessional and even a little ruthless. There was little fun or relaxation in him as he drove himself and those around him to the limit of their abilities. It was all about work and money, saving here and saving there, sharing nothing, not even his time. Alas, his lesson about money and possessions, when it came, hit hard and fast. He lost everything in The Five of Pentacles and found himself cast out on the street like so many others, with no money, no food, and no roof over his head. For a time he was lost. His stubborn pride prevented him from seeking help or support, for he was used to being financially independent and self-sufficient. He came close to breaking at one stage but his natural Pentacle’s survival instinct kicked in and he fought back. Swallowing his pride, he sought assistance and took all the help he was given. He became employed once more in The Six of Pentacles and even though it was not what he had been used to, he was a hard worker and slowly but surely made his way up through the ranks again, and began his quest for success in earnest once More. He worked hard all the way through The Seven of Pentacles only taking a break to check that he was still on track and heading in the right direction. He knew he was making progress for his success was beginning to manifest all around him. His hard work was beginning to pay off and he was nearly there. No longer, the young boy of the Ace or Two, he had matured spectacularly into the highly skilled Master and Expert of The Eight of Pentacles. He had grown up and come of age, so too had his abilities which could be seen in the high standard and quality of his work. He had several qualification under his belt by the Eight and was highly committed and dedicated to his craft and choice of life. The money was rolling in and he was at last seeing the rewards for his years of relentless dedication and determination. He was also getting public recognition and was very highly thought of and respected in the community, and by his peers. He had an impeccable reputation and his work was much sought after. Not only was he committed to his work, he was also a committed and loyal family man who cared deeply about his partner and children. He wanted to provide a stable and secure home for all of them. He had been drawn to his partner because she reminded him or himself. She was bright, ambitious and down to earth. Practical and thorough, she was a great business woman too. She followed her own career but helped him with his too whenever she was needed. They understood each other and accepted that on many occasions, work would have to come first and pleasure second. Their children grew up with this understanding too and were proud of their working parents even if they were not always available. 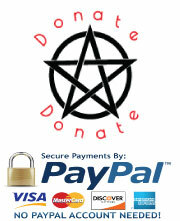 The Pentacle parents taught them the value of money and to respect the effort that is required to make it. Their parents may not always have been around when they were growing up but they lacked for nothing and knew they were loved and cherished. They went to the best schools and were taught to be ambitious from an early age, to plan for their future, and then save for it. As parents they had both started with very little but had made a success of their lives. Their children had the advantage of a good start in life but even though they had been born into success, their parents were not foolish enough to let them think that it was their god-given right or that things came easy. They would be expected to prove themselves, their worth and follow in the family tradition of being hard, honest and dedicated workers. We had missed him in The Nine of Pentacles, when we spent time with his lovely partner or spouse. He was away doing what he loved and she was suitably occupied doing what pleased her too. They may not have had the pleasure of each other’s company in The Nine of Pentacles but they were solid and strong enough in themselves to be able to enjoy their own solitude without being lonely. These were not people who would slip into retirement or old age too easily. While they very much enjoyed their new-found free time and rich comforts, they would never completely stop working. They would continue to have some input or active interest in the business world. For the Pentacles Man and Woman or Couple it was always going to be very hard to let go altogether, for although it had been a lifetime of work and effort, they had thoroughly enjoyed it. Most of the time it didn’t even seem like work to them. However, time does move on and we all must acknowledge that we are not as young as we once were or that it would be foolhardy to attempt to keep up the same pace and level of activity of our younger years. In the Ten of Pentacles, the Pentacle’s Man has eventually had to come to terms with this aspect of his life. He has done his bit and it is now time to hand it on, or down to, other’s so that they can do theirs. He can relax and enjoy his golden years, content in the knowledge that he will be leaving a wonderful legacy for his family and those who follow. His shoes will certainly be hard to fill but he has planned well for this stage of his life and has left nothing to chance. As he sits in the Ten of Pentacles, he gives his attention to his beloved dogs and constant companions. He grew up with animals and always had a deep love and respect for them. He admired their loyalty and complete devotion and in return he loved them dearly and looked after them well. The dogs look adoringly at the old while he gently strokes their head and talks to them. He made sure to instill a love of the animal kingdom in his children and is happy that they too are continuing this tradition. They always had dogs and he couldn’t imagine a loving home without pets. The Pentacle’s Man sighs with deep content as he takes in his surroundings and those he holds close to his heart. He sits at the entrance to his kingdom, his family estate, and takes ownership of it by placing his family crests on the strong stone walls. Let no one be mistaken in who owns this domain, this establishment, this property, business or land for this is his. It belongs to him and his kin-folk. He has built it brick by brick, and much of it with his own bare hands. This his work without a doubt and what a success it has all been. He looks in through the archway at the man and woman with fondness and pride. These may be his son and daughter, his son or daughter with their partner or they may even be his grandchildren all grown up and now adults too. The woman has a child with her who teasingly pulls the dog’s tail in an attempt to get his attention. The child is yet another symbol of the family and new generations of that family. It is interesting to note that both the child and elderly man appear to find company with, and attention from the family pets, while the adult couple can only spare the time to talk to each other in passing rather than stopping for a proper talk. This can symbolically suggest numerous scenarios but we must remember the way the Pentacles People operate. Ambitious and industrious, they rarely have time for idle gossip or frivolous behaviour. The couple and child can symbolically represent the hardworking parents who pass each other going in and out the door to work, dropping kids off and picking them up from childminders and creches, combining parenting with their relationship and demanding careers. It is all go, non-stop, and both children and partner must understand and accept that they may not get undivided attention every time they look for it as everyone is busy and have things to do. Daddy must work and so must Mammy if they all want to live in a big house and go to the best schools. The Old Pentacle’s Man looking on at this is very aware of the sacrifices he made with his own family when it came to building his empire. He understands that a fine balance has to be achieved and maintained in order to minimise the damage to all involved. Personal sacrifices are one thing, but when others can be potentially affected by his decisions, he always aimed to make wise ones and ensure all were properly catered for. Looking around him he feels reassured that his lifetime’s work has not been in vain. He has properly provided for and cared for his family, and will leave them secure in the knowledge that they will be well looked after when he is gone. He casts his mind back to where he came from and what he had starting off, and compares it to what he is leaving behind. He finds a changed world, the world he strived for and successfully achieved. He takes in the solidity of the surrounding strong walls and buildings and feels the stability of the earth beneath his feet. His lifelong investment in property and land has rewarded him well. Putting his money into bricks and mortar was always part of the long-term plan and has provided evidence of his lasting wealth. As he dwells on his kingdom he feels the twinges of arthritic pain and becomes aware of his own mortality. He looks to the man and woman with their child, the people who will inherit all that he has worked for. He feels confident that they will be able to carry on successfully with out him when his time comes, for he has trained them well. Whereas once he cared for and provided for all of them, they must now take their turn and look after him. Regardless of how old or frail he gets, they must keep him at the heart of the family for that is what strong loving families do for each other. His partner or spouse may be inside the house or off visiting one of her children, but she also may have passed away. It is only right and fitting for his family to protect him until his time comes. In The Upright Ten of Pentacles, the family look happy to do this and the elderly man looks comfortable and well nurtured, even if he is left on his own at times. Whereas the couple worry about the welfare of the elderly Pentacle’s Man, he still worries about their welfare. He is all too aware that they have never been exposed to hard times or the kind of want that he experienced in the past. To the left of the elderly Pentacle’s Man is the black and white checkered entrance to a distant memory of the trauma in his life. The faded grey outline of The Tower reminds him of the catastrophic effect it had on his life in The Five of Pentacles. Up until the Five, he had thought to be in control and in a safe, secure position. Just like the black and white checkered frame, he went from riches to rags, from white to black, from one extreme to the other, in one foul swoop. Whatever foundations he had built up to the Five, turned out not to be strong enough to resist the force of The Tower, and it all came toppling down around his feet. He was left staggering in the wake of the crash but luckily for him he managed to keep upright and not collapse like so many others did. The power of The Tower still haunts the back of this mind and he can only trust that the foundations he has built on since will be able to withstand its force should it ever strike again. However, he cannot cover every eventuality and must have faith in those who follow to protect these foundations. They will have a duty as custodians of the family empire and line to strengthen and reinforce the foundations and to ensure that any new additions or constructions are based on the tried and tested standards of the past. Not only must his empire maintain strong foundations but so too must the family stay strong and united. In The Ten of Pentacles we may be looking at several generations with these four people alone, ancestors and descendents, and suggests family lines and continuity. All these people feel the blood of their family course through their veins and their heart beats to the same drum beat of their parents and their parents before them. As each generation is born, they inherit family traits, personalities, talents and abilities in their genes. They also inherit, family morals, ethic, traditions and beliefs. On the material plane they will inherit any Family Land, Property, Business and of course Money and Assets. With everything inherited comes responsibility. They may also inherit negative aspects such as predispositions to health problems so they must be prepared to take the good with the bad. And so the line continues safe and intact, and certain expectations for each succeeding generation are passed on by their predecessors. Children are born to each generation and in many cases are expected to follow in the footsteps of their parents. Therefore, farmers may expect their children to follow suit, doctors might expect their sons and daughter to enter the medical profession too and musicians may presume their offspring will be just like them. Certain families build up huge reputations around their family traditions, skills and professions and sometimes we only have to hear a person’s surname to know who they are and what they do. These archetypal families are usually very close-knit and all are happy and proud to be a part of their history and continuity of it. They are deeply involved in the family and all that it expects of them. Loyal and committed they are part of a tight team and all work towards a common goal to ensure continued success. These families provide security and stability for the individual members along with a strong sense of who they are and where they have come from. They support each other not out of obligation or duty, but because of love and unity. The Ten of Pentacles symbolises the strong and solid family unit as above and problems only occur when certain family members choose not to follow or break with tradition. Even in this scenario there should not be any real problems if the family are open-minded enough, encourage free thinking and believe that everyone should follow their own path. However, as many of us are aware, families can be both a blessing and a curse. Family traditions may be forced with members feeling under obligation or duty-bound to comply. Terrible pressure can be put on the individuals to toe the line or risk excommunication or disinheritance. Parents can be demanding of their adult children and use emotional or material blackmail to control and keep order. Looking after an elderly parent is not welcomed and neglect may occur or there may be hidden agendas involved usually surrounding inheritance issues. These families are built on oppression and tension with family events loaded with stress and dread. There will be a strong Patriarchal or Matriarchal Figure who hold the reins tight, and can be stubborn and unyielding when challenged or exposed to change. They can oppose the choice of their offspring’s partners, career wishes or place of residence if they do not match their own expectations and standards. This can cause difficulties and arguments which can result in the withdrawal of affection, communication and privileges. The results of such situations are often reflected in the wills of parents when there is a huge discrepancy in the distribution of monies and assets among family members. Family honour, pride and toeing the line are all suggested by this Ten. When you are born into wealth, certain things are expected of you. Where you will go to school, what sports you should take up, who you should be friendly with, who you should date and what direction your career should take? Money does not always bring freedom especially when you have not personally earned it yourself. Duty to your family and an unspoken expectancy of obedience can be part of the price one may have to pay when you come from a privileged background and stand to inherit. Introducing outsiders to the inner sanctum of that family may not always work out favourably and they can often be made to feel very unwelcome. The Ten of Pentacles is a card of traditions, conventions, solid foundations and long-term establishments. There is safety suggested and the sense of a tried and tested solidity and old values. The elderly Pentacles Man has been methodical and thorough. He has stuck to what he knows works. However, sometimes change is good or refreshing or even just trying out a new approach. The energy The Ten of Pentacles brings is not generally in favour of such an attitude or risky behaviour. However, the young couple may have plans for the future that differ from what The Elderly Man has envisioned. They may feel that the time has come to make some changes or try out new methods with the aim of moving forward and making progress. It will be hard to convince the Pentacle’s Man at his stage just as it is hard to teach an old dog new tricks. They may have to wait until they inherit before they can introduce any changes new approaches. The Ten of Pentacles very nicely shows off the energy of The Wheel of Fortune and The Sun Card. Circumstances are very favourable and everything is going well as The Wheel of Fortune puts The Pentacles in a very advantageous position indeed. The Pentacles have experienced the Reversed Aspect of The Wheel in Card Five when they were down on their luck. Thankfully they have learned their lesson and have made provisions that will tide them over such times in the future. They understand that even though it may be sunny now, there will always be rainy days ahead to be endured and survived. They have a contingency plan in place now and should be able to weather any storm that comes their way. The Sun Card with the little child on the horse suggests birth, new generations and good times to be enjoyed by all. 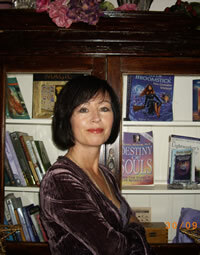 Well done to The Pentacles. Mission Successfully Completed.